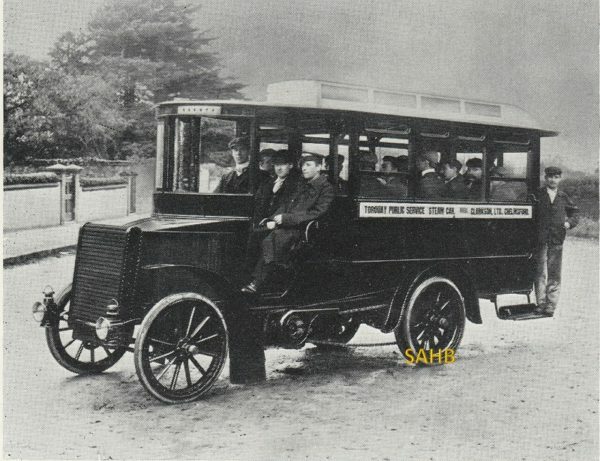 The products of Clarkson Limited enjoyed a considerable amount of this success – and we can see here an example of one of their early steam buses dating from 1903. Thomas Clarkson first made a steam-powered vehicle in 1896 in partnership with Herbert Capel. ‘The Engineer’ periodical organised a competition for the most practical road vehicles, and Clarkson formed a syndicate with Capel and two others to build an entry. With its curious appearance, not unlike Cinderella’s coach but with the driver mounted high at the back, and a complex mix of water-tube boiler and an engine variously described as vertical and as a six-cylinder radial, this curiosity was failure – but the Clarkson-Capel syndicate went on to create a successful business producing burners for imported American steam cars. In 1902 Clarkson moved his company to Chelmsford and started to manufacture steam cars – many of them called Chelmsfords – and focused upon the market for commercial vehicles, in particular steam buses. The bus in our picture proudly announces on its display board “Torquay Public Service Steam Car. Clarkson Ltd., Chelmsford” – which implies that this was a publicity shot. Torquay was one of the very first customers for these buses, before Clarkson decided to begin operating his own services in the London and Chelmsford areas. Monotube water-tube boilers were used, consisting of steel tube of ½ inch inside diameter in a single length of 12 conical spiral coils. Water entered the top coil and steam at 800 degrees Fahrenheit and 300 psi emerged from the lowest coil. Initially disappointing efficiency forced several redesigns, but by 1909 we hear of the popular success of Clarkson’s buses in London and Essex. A test run from Chelmsford to Folkestone and back was made at an average speed of 13.6 mph for the 186-mile journey. Clarkson steam buses became the first buses ever used for the transport of British troops with the mobilisation of Essex Territorials in 1908. By the outbreak of World War One there were nearly 200 of these buses in the London area, operated by the National Steam Car Company. After the war, shift-working changes and an agreement with the London “General” bus company to keep the steam buses outside a 30-mile radius from the centre of London led to the demise of the steam buses, but they left behind many memories of silent and efficient operation. Clarkson continued to develop his boilers, and his Thimble Tube boiler was used for many years in vertical boilers for fixed industrial and mobile merchant marine use. His company was merged with Babcock and Wilcox in the late twenties.